A year after a deadly gathering of far-right extremists in Charlottesville, Va., a few dozen white nationalists marched Sunday across from the White House, their numbers dwarfed by thousands of counterprotesters, while the mother of a woman killed at last summer's protest said the country continues to face unhealed racial wounds. Counterprotesters who assembled ahead of the rally's scheduled start vastly outnumbered Kessler's crowd. 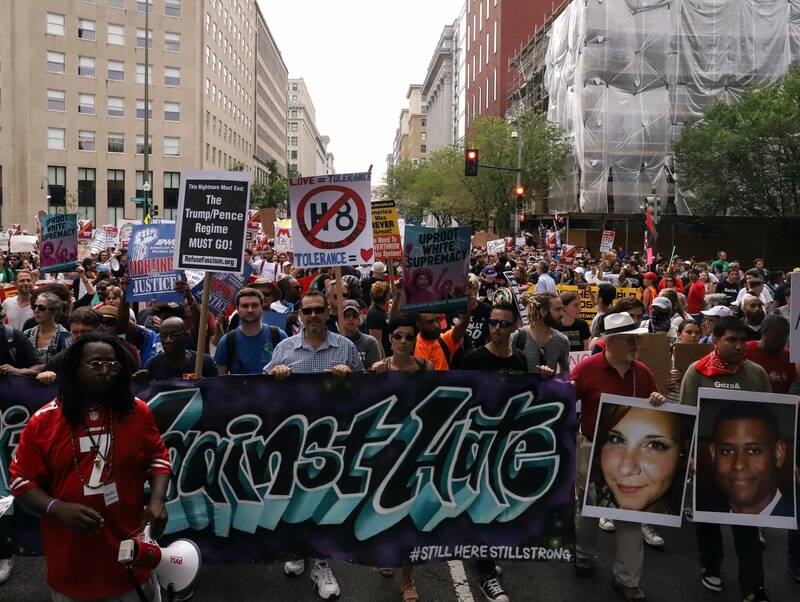 By midafternoon, more than 1,000 people had already gathered in Freedom Plaza, also near the White House, to oppose Kessler's demonstration and also march to Lafayette Square. On Aug. 12, 2017, hundreds of neo-Nazis, skinheads and Ku Klux Klan members and other white nationalists descended on Charlottesville, in part to protest over the city's decision to remove a monument to Confederate Gen. Robert E. Lee from a park. 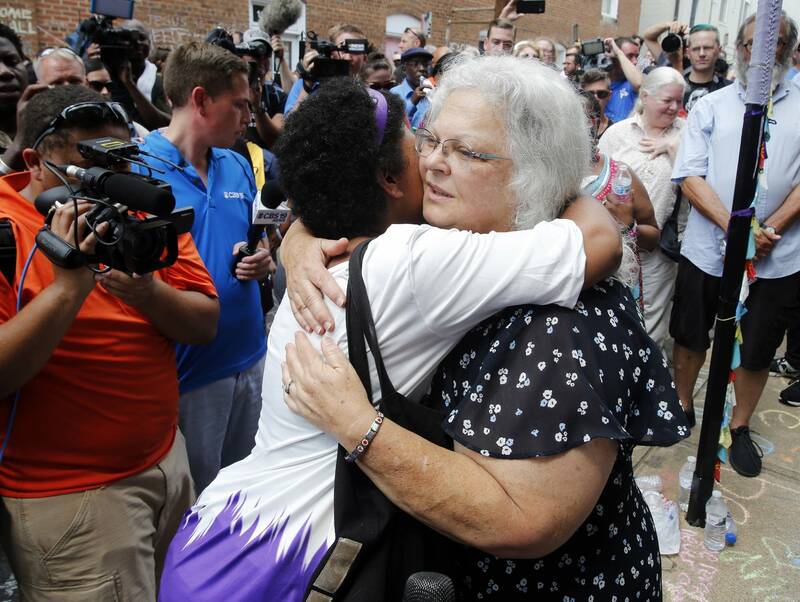 In Charlottesville on Sunday, the mother of a woman killed when a car plowed into a crowd of counter-protesters at a white nationalist rally last summer said there's much healing to do a year after the violence. The city of Charlottesville said four people were arrested. Two arrests stemmed from a confrontation near a statue of Confederate Gen. Robert E. Lee where a Spotsylvania, Va., man stopped to salute the statue and a Charlottesville woman confronted him and a physical altercation took place, officials said. Earlier this month, Facebook stunned and angered counterprotest organizers when it disabled their Washington event's page, saying it and others had been created by "bad actors" misusing the social media platform. The company said at the time that the page may be linked to an account created by Russia's Internet Research Agency — a so-called troll farm that has sown discord in the U.S. — but counterprotesters said it was an authentic event they worked hard to organize. 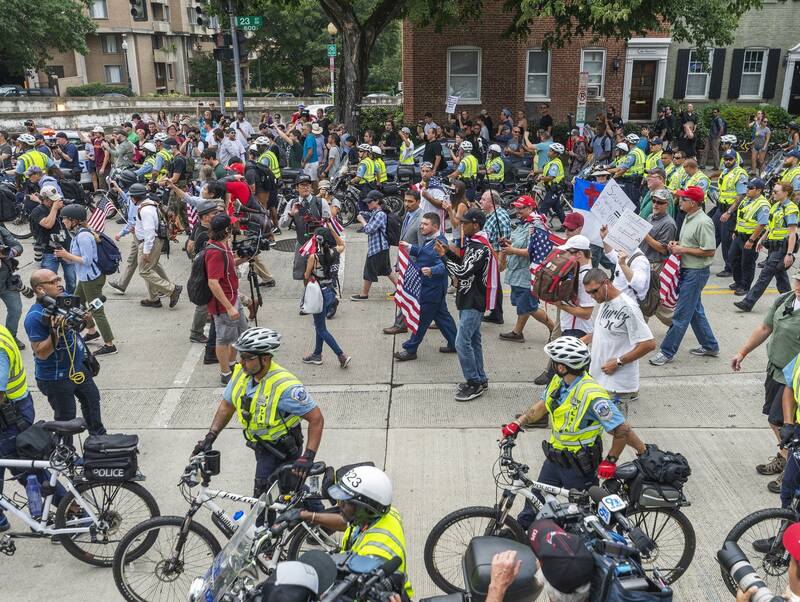 Government and police officials in Washington expressed confidence the city could manage the events without violence; the mayor and police chief promised a massive security mobilization to keep protesters and counterprotesters apart. Law enforcement officials faced blistering criticism in the aftermath of last year's rally for what was perceived as a passive response to the violence that unfolded. A review by a former U.S. attorney found a lack of coordination between state and city police and an operational plan that elevated officer safety over public safety. At one point Sunday, demonstrators marched through Charlottesville, chanting, "Cops and Klan go hand in hand," and "Will you protect us?"